ZTE, Huawei: Can China ever become a true innovation powerhouse? A Future Tense event. Will China’s Scientists and Technologists Ever Be Truly Innovative? 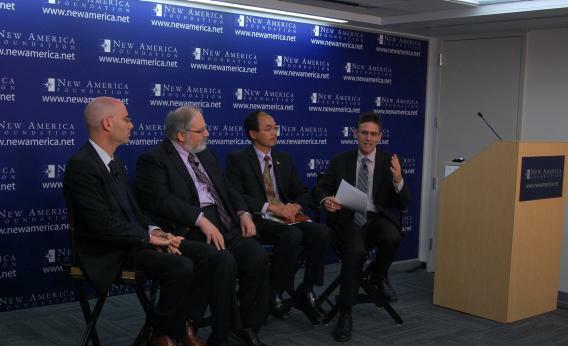 From left: Adam Segal, Denis Simon, Yifei Sun, and Steve LeVine. Just this week, a House of Representatives committee issued a report warning the United States against doing business with two major Chinese tech firms, ZTE and Huawei. The companies were closely tied to the Chinese government, the report said, and could be stealing information from the U.S. government and American businesses. In opening remarks, Steve LeVine, Washington correspondent for Quartz magazine and a Bernard L. Schwartz fellow, established the questions for the day: Can China ever become an “innovation juggernaut,” just as it is a world leader in manufacturing? Does “innovation” have to mean breakthroughs, or is incremental innovation—small tweaks on Western-made technology to make it cheaper and sometimes better—enough? And should the rest of the world be worried? -Creativity isn’t encouraged: Segal argued that while we focus on the “hardware”—the more tangible results of innovation, like patents filed—China needs to focus on the “software” problems of culture. In China, researchers aren’t urged to think creatively, nor do they feel free to fail. “No risk, no reward” may be a cliché, but it is also a truism. -Quantity is valued over quality: According to Huang, the number of journal articles published by Chinese researchers has exploded in recent years. But outside of the life sciences and biology, the level of impact from this research has remained fairly flat—indicating that the research is not high-quality. In part, this may be because researchers are paid per publication, so repetitive research and short-term work is incentivized. -Intellectual property rights are not respected: Since patents and copyrights are frequently violated, there is less incentive to create. China’s leadership understands all of these things, said Segal. In fact, they have probably visited Silicon Valley “more than anyone,” he joked. Accordingly, China’s 2006 mid- to long-term plan for science and technology development emphasized the need for better intellectual property protection, for startup culture. But politically, introducing these elements will be very difficult—especially, as Simon noted, because the politicians have other significant worries on their minds, like domestic protests. Still, they understand that the “transition to a knowledge economy” is critical, and accordingly they want to be the No. 1 or No. 2 country in the world for innovation by 2049—China’s centennial. That’s one reason why they are expanding investment into R&D, going from 1 percent of GDP for a long time to 2 percent of GDP in 2011. But China isn’t doing this only for financial reasons, according to Segal—the country also wants not to have to depend on the West for its technological and scientific needs. There are some positive signs here for China. For instance, Simon said that more and more research funding is coming in at the local level, not from the national government—a “systemic change,” he termed it. And while many Western companies opened their research labs in China initially because the government effectively made it a condition for selling goods in the country, said Sun, they are increasingly producing interesting work. No breakthroughs yet, he acknowledged, but they may come soon. China’s most successful fields—nanotechnology, life sciences, biology—are those that have been open to international collaboration. Watch the entire event on the New America Foundation website.